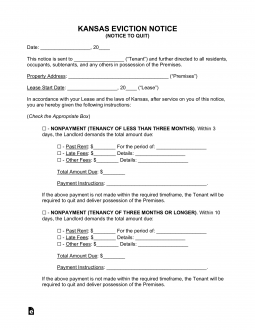 The Kansas eviction notice forms may be used in the event that a landlord has a tenant who is failing to abide by the terms set forth in the lease, whether it is for non-payment of rent or other issues. In each situation, a landlord must provide written notice to the tenant of landlord’s intention to go to court and have the tenant evicted if the tenant does not either move out or remedy the situation. In some cases, the tenant cannot remediate and must move out. If the tenant does not respond appropriately, the landlord may file the Civil Information Sheet and the Petition for Eviction. 3-Day Notice to Quit (Non-Payment) – In accordance with § 58-2508 for tenancies for a period less than three (3) months. 10-Day Notice to Quit (Non-Payment) – In accordance with § 58-2507 for tenancies for a period of three (3) months or longer. 14-Day Notice to Quit (Non-Compliance) – In accordance with § 58-2564 the tenant shall have fourteen (14) days to correct the lease violation. If they do not correct they will have thirty (30) days to vacate the premises. 30-Day Notice to Quit (2nd Non-Compliance) – In accordance with § 58-2564 the tenant shall be submitted this notice if they have violated their lease in the same way for the second (2nd) time in the last six (6) months. There is no option for the tenant to remediate and they shall be forced to move within one (1) month. 30-Day Notice to Quit (Month to Month) – For all tenancy at wills in Kansas the landlord or tenant must provide at least thirty (30) days’ notice in order to cancel the arrangement (pursuant to Statute § 58-2570). Rent is due on the date agreed upon in the lease agreement. A late fee may begin being charged the day after rent is due in addition to any notice to quit (for non-payment) being sent to the tenant. (§ 58-2545). Step 2 – If the tenant fails to respond to the notice then the landlord may begin the eviction proceedings. This will begin with the completing of the Civil Information Sheet and the Petition for Eviction (1 original and 2 copies for every tenant). The Petition for Eviction must be signed by the landlord in the presence of a Notary Public. All forms must be filed in the District Court of the County where the property is located. There will be a filing fee that is set by each jurisdiction. Step 3 – After the filing, the landlord must obtain the Summons (1 original and 2 copies) from the Clerk. This will state the Court Hearing Date and this form must be served on the tenant (defendant) along with the Petition for Eviction by the County Sheriff. Step 4 – After the hearing, the landlord must complete the Journal Entry of Judgment (1 original and 2 copies) and send to the tenant along with the Certificate of Service. Step 5 – If the tenant remains on the property after the judgment the landlord has the option of filing the Writ of Restitution (1 original and 2 copies) which will get the County Sheriff involved and the tenant will be removed within ten (10) days. Step 6 – If after the tenant has been removed from the premises they may seek additional damages by filing a Motion which must be filed with the Court and sent to the tenant via the attached Certificate of Service. You will need the Signed Lease Agreement in your possession for easy reference as the information it contains must be reported accurately. The Notice may be downloaded directly to your machine using the buttons on this web page. You may find the buttons “PDF,” “ODT,” and “Word” located on the right. Each one will define the file type available. The Rental Property this Notice refers to must be documented by reporting the Physical Location as it is defined in the Lease. Starting with the blank space after the words “City of,” report the City, County, Zip Code, Building Number/Street, and Apartment Number of the residence this Notice concerns itself with. Locate the words “signed on…” then enter the Calendar Day of the Month the Lease was Signed. On the space following the term “day of,” enter the Month the Lease was Signed. Lastly, on the next blank space, enter the Year the Lease was signed. Next, the Tenant or Subtenant must be informed of the action(s) involved with this document along with the reason for its issuance. Choose the checkbox labeled “Nonpayment,” “Noncompliance (1st Offense),” “Noncompliance,” or Month to Month Tenancy.” You must choose one of these checkboxes to name the requirements of this Notice. Choose “Nonpayment” to inform the Tenant he or she has ten days to pay the Landlord or the Authorized Agent you identify the Dollar Amounts reported here for the Time Period you define as being delinquent. If the Amount Due is not received from the Tenant or Subtenant the Landlord will expect to receive the property within ten days of receipt of this document. (Note: If the terms of the Lease are less than three months, the Tenant will only be given three days). Choose “Noncompliance (1st Offense),” if the Tenant has been noncompliant with Lease Terms to warrant his or her first official warning and will be given fourteen days to correct the problem before having to relinquish possession of the property to the Landlord, Owner, or Authorized Agent. Choose “Noncompliance” if the Tenant is receiving his or her second official warning regarding a violation and is being given thirty days of receipt of this Notice to vacate the property. You must list the violation on the blank line in this statement. Choose “Month to Month Tenancy – I am your Landlord…” if you are a Landlord informing a Tenant that his or her Monthly Lease Agreement will cease on the Date you list here. Note: This must allow for at least thirty days of receipt of this notice to pass before the termination occurs. Choose “Month to Month Tenancy – I am your Tenant…” if you are a Tenant informing your Landlord the Monthly Lease Agreement you hold will cease on the Date you report in this statement. Make sure that at least thirty days pass between the Date of Receipt and the Date of Termination. The Landlord Signature line at the bottom of the block paragraph serves as verification of the Landlord’s intentions should the Tenant be noncompliant with this Notice. That is, the Landlord or an Authorized Agent of the Landlord must Sign this line. The Delivery Agent is the individual who is charged with making sure the intended recipient receives this document at the intended time. This individual must document the Date of Delivery and the Name of the Recipient in the statement directly below the words “Certificate of Service.” Below this the method of delivery must be indicated by the agent by checking the appropriate statement. This will define the recipient as the Tenant or Subtenant this Notice is addressed to or a reliable second party (i.e. co-worker, family member). If hand delivery is not possible, the third checkbox will be marked to indicate it has been mailed First Class.